Ask your Customer Service Representative about this month's PIE OF THE MONTH and our monthly CAKE SPECIAL! You can also check out the dates for the current month's features from our CALENDAR page, and the descriptions from our NEW PRODUCTS page! Our Fall Holiday Season Specials are past - but they will be back again next fall - keep an eye on our Calendar page for starting dates! Click here for a printable one-page listing of "All Products" in a ".pdf" (Adobe Reader) format. Click here for our printable two-page "Handling Guidelines" with information on storage, preparation, and shelf-life. 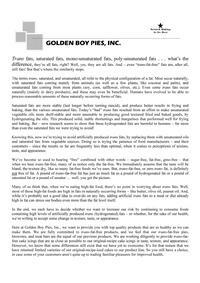 Golden Boy Pies Offers Trans-Fat Free Cakes! 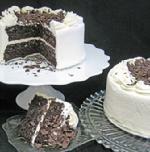 Many of our cakes qualify as Trans-Fat FREE! Switching to Trans-Fat Free ingredients does change the texture of certain products, such as icings. Because some of our customers prefer the texture of our original icings, we do still offer "Original-Recipe-Iced" Cakes in most flavors. Please ask your Customer Service Representative which cakes qualify as Trans-Fat Free. 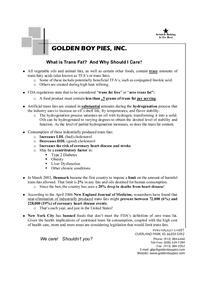 What is Trans-Fat? And Why Should I Care? you can be sure they'll be 100% delicious! Our pies are all deep dish, 9-inch, made from scratch, without artificial ingredients. For the fillings, we use the real ingredient: fresh-frozen fruits, real eggs and milk, real chocolate, fresh bananas; and, for the crust, trans-fat-free vegetable oil shortening & unbleached flour. We bake our pies in a heavy aluminum foil pie tin, to get that just-right, flaky pastry crust - your sure sign of quality baking. Click here for a complete listing of all our pies! Our cakes are available in 8-inch Round Layer cakes (two layers unless otherwise specified), as well as single-layer Half and Full Sheets. And now, some are even available as Cupcakes! Most of our customers cut the 8-INCH ROUND cakes into ten (very large) to 14 (small but plenty) slices. A FULL SHEET is 24" by 16". Cut into 2" by 3" pieces, you'll get 64 servings. A HALF SHEET is 16" by 12", providing 32 pieces when cut into 2" by 3" pieces. Click here for a complete listing of available cakes! We offer three special types of Coffee Cakes! Want a moist and hearty coffee cake for brunch? Start with our time-honored Carrot Cake as a base, in your choice of either an 8-inch Round Single Layer or a Half Sheet (not available in Full Sheet), and then choose from two different toppings! Also try our special recipe Spice Cake simply topped with Vanilla Glaze, a Single Layer in your choice of either Half or Full Sheet (not available in 8" round). A ROUND SINGLE LAYER is 8" in diameter, usually providing 10 triangular pieces. Click here to view our complete listing of our coffee cakes! Our Deep 9-inch Cheesecakes are real New-York Style Baked Cheesecakes. They're available pre-cut into your choice of 12 or 16 slices. Click here for complete listing of all our cheesecakes! A yummy complement to our traditional brownie line. Baked as a bar, like a Brownie, but without the cocoa! Full of buttery goodness!! A QUARTER SHEET is 12" by 8", providing 16 servings of 2" by 3" pieces. Our brownies are the richest, fudgiest ever! Chocolate chips are baked into every bite. And, you get choices, choices, choices! Click here for a complete listing of all our brownies! Just Simple Finger Food - Old Fashioned Treat Bars, with a flaky pastry crust. Click here for complete listing of available treat bars! Our No-Sugar-Added line continues to increase. 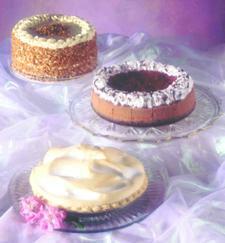 We offer all sorts of pies, cakes, and cheesecakes! And we dare you to tell the difference in taste from our regular sugar-sweetened line!